Cash-strapped governments around the world are turning to market-based schemes that preserve endangered species by incorporating the cost of habitat destruction into the cost of development, according to a new report compiled by Ecosystem Marketplace. Unfortunately, most schemes lack the transparency needed to send the kind of price signals necessary to create an incentive to conserve. WASHINGTON, DC | 5 March 2010 | Becca Madsen never dreamed it would be this difficult. 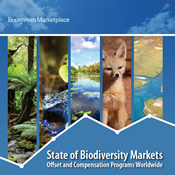 The “it” is State of Biodiversity Markets: Offset and Compensation Programs Worldwide. A full year in the making and now available for download, the report is a global survey of schemes designed to preserve biodiversity by making it possible for real estate developers to offset their damage to nature by paying for the creation or preservation of habitat. Madsen and her EM team, together with colleagues from Economics for the Environment Consultancy (eftec) and a PhD candidate from the Queensland University of Technology, found that such schemes are proliferating across the globe as cash-strapped governments look to cultivate economic growth without endangering nature’s diversity. 80% of the schemes, however, lack the transparency necessary to generate price signals. That makes it difficult to calculate the true cost of environmental degradation, which makes it difficult to create an economic incentive for developers to conserve nature. The report documents 39 government-mandated “compensatory mitigation” schemes around the world and 25 others in the works. Such schemes require developers to avoid damaging natural habitat when possible and force them to rescue or restore habitat equal to or greater than that damaged if they do impact nature. More than 600 “species banks” or “mitigation banks” operate within these schemes. Such banks seek to earn income by securing commercial or degraded land and returning it to its natural state to generate offsets for developers who damage habitat by digging mines or building roads and houses. When properly-structured, mitigation schemes generate a net environmental benefit by creating a natural habitat that is both larger than the area damaged and potentially better integrated into the regional ecosystem. Roughly 70% of all species banks are private operations that seek to earn a profit, while others are government-run utilities or non-profit organizations. Either way, the environmental benefit flows from the creation of an economic incentive to tread lightly on fragile habitat. It caught her by surprise, she says, because in all her years with the US Forest Service and Ecosystem Marketplace, where she runs the biodiversity program, she had never heard of any programs in Queensland. “It was like there was this whole world out there that I didn’t know existed,” she laughs. Only 20% of the documented projects generate price data, but these revealed a market of between $1.8 billion and $2.9 billion per year. Additionally, the schemes place at least 86,000 hectares of land under some sort of conservation management or permanent legal protection per year. That’s equivalent to the size of Manhattan, and the real impact is likely far greater since so few programs had aggregate figures on land conserved. The report offers a region-by-region breakdown of existing and impending projects in North America, Latin America, Europe, Asia, Africa, and Australia and New Zealand as well as an analysis of the unique legal framework within which each scheme is being implemented and the means of incentivizing private-sector investment. The schemes tend to evolve in jumps and starts as new methods are tested, discarded, improved, and retained. Different parts of the world tend to have different types of investors in biodiversity compensation. Across the United States, for example, local departments of transportation are often the leading users, while in Australia, it’s water companies seeking to offset damage done while laying pipes. In South Africa, it’s the mining and metals sector. “Ironically, the development of alternative energy schemes built on wind and solar could lead to new demand for species banks,” says Madsen. “That’s because you need to have transmission from the source of the energy to the grid, and that’s all going to impact habitat.